I've got the tutorial bug after doing one last week on roses - and this one has been requested by one of my Twitter followers (@JazebelleKiss) - who asked for corals, but I discovered I actually don't really own any corals so I went for the most corally pinks I have. I hope it lives up to expectations and you can work out how to do it from the instructions below! If you haven't tried doing a gradient before, you should! 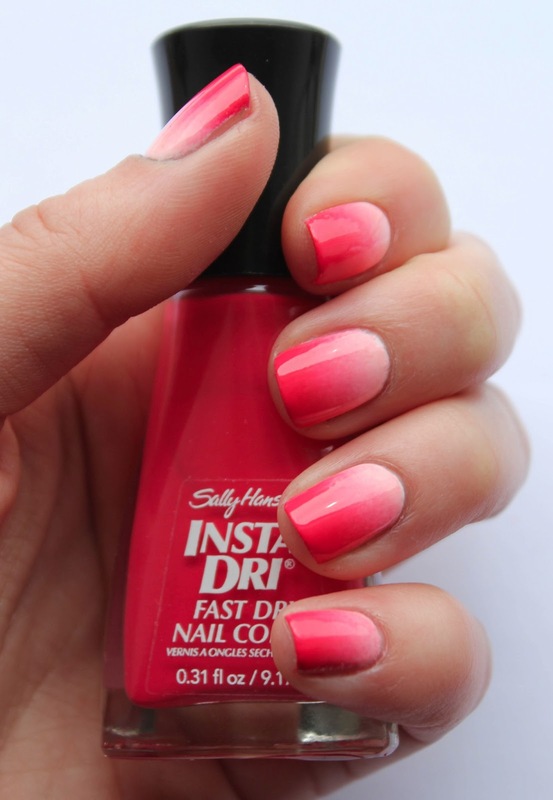 It's honestly, I think, one of the easiest ways of making a plain mani look a little bit more interesting - and it doesn't take very long, either. - Thin, flat brush (for clearing up the sponging) (mine was from my eBay set). 1. Paint a white base for the gradient (to make sure the colour pops) - mine was two coats. Let it dry. 2. 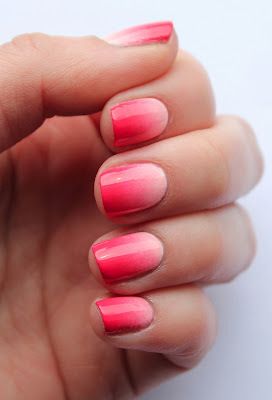 Paint stripes of the two/three colours on the end of the make up sponge - on the end put the colour you want at the base of your nail. 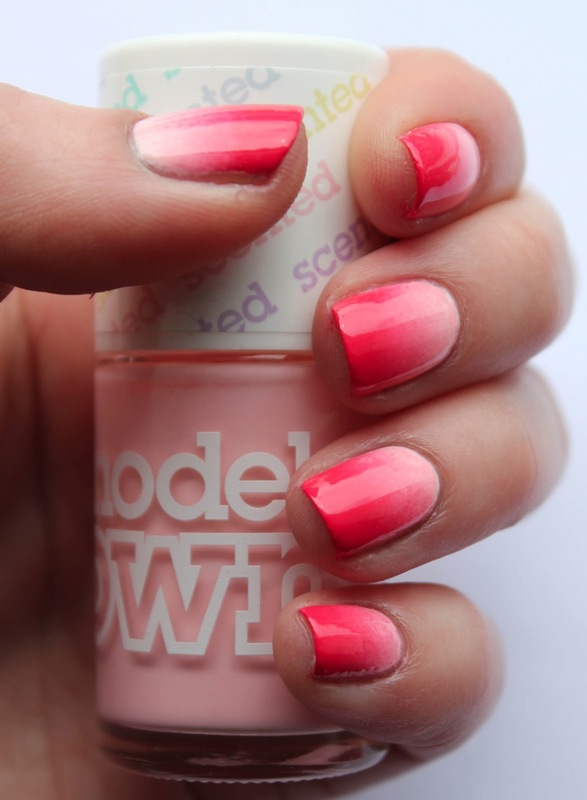 Measure it against your nail so you've got about the right length (doesn't need to be particularly accurate). If it looks like there's a lot of polish on the sponge, you can sponge it onto a piece of paper - but the sponge will absorb quite a lot anyway. 3. 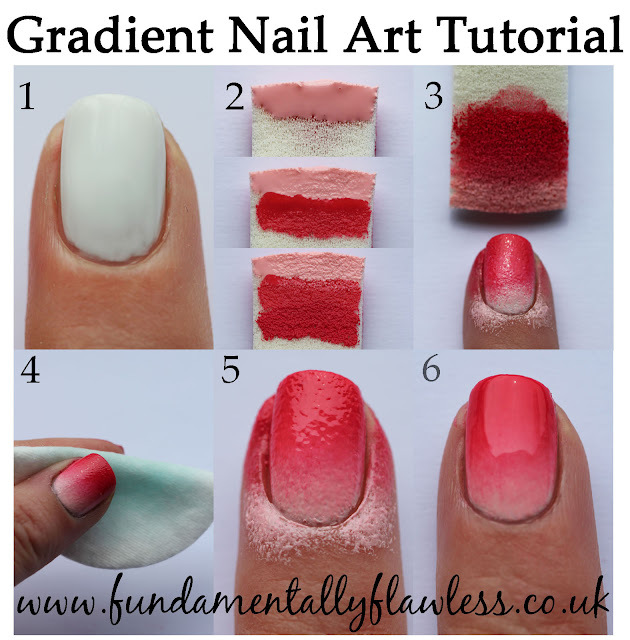 Lightly dab the sponge onto your nail, moving it up and down a little to make sure the lines of different colour aren't too prominent. 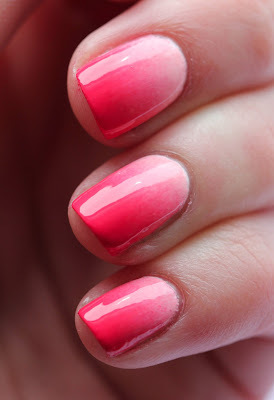 Make sure you get into the edges of your nails (doesn't matter about getting it on your fingers). 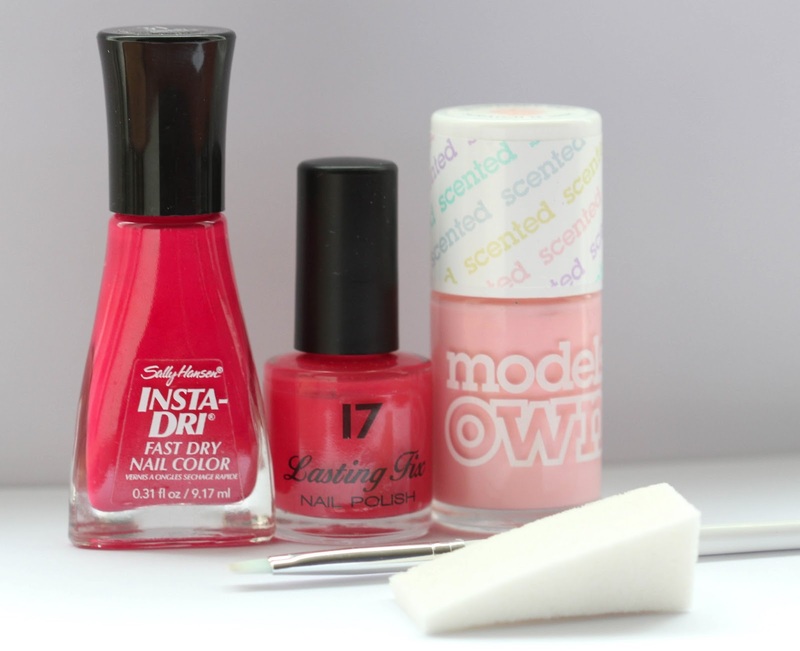 You may not need to stripe polish on the sponge between each nail - see how it goes. Let it dry (it won't take long). 4. At this point, I clean up my fingers - I tend to do it between each sponging as it comes off a lot more easily when it's a little wet. I use a folded cotton wool pad so I have a nice edge to work with. 5. Repeat the sponging a second time (perhaps more if you want more pigmentation, it depends how bright your colours come out). 6. Clean up again. 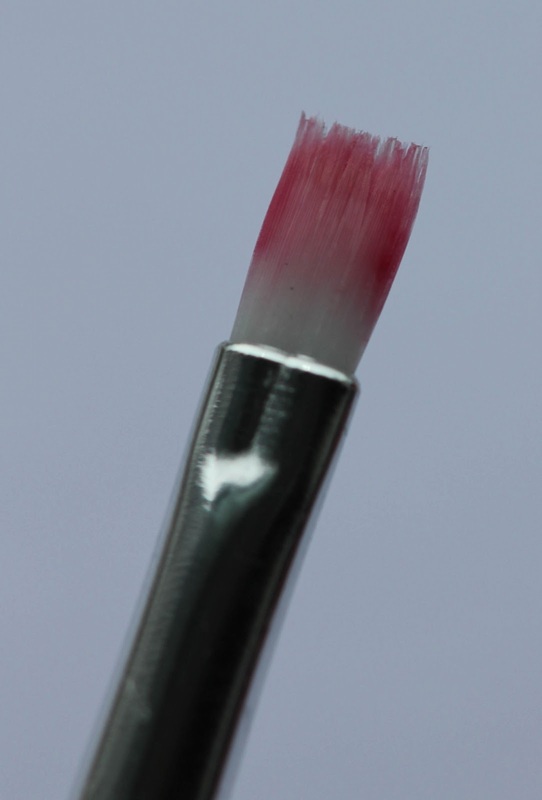 This time, use the paintbrush to tidy up the edges of the nails and around the cuticles. 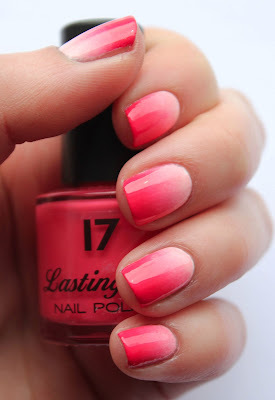 Pop a top coat on (I used No 7 Stay Perfect), sit back and admire your handiwork! Let me know if you try out the tutorial - I would love to see your work. Pop a link in the comments below, Tweet me (@fundaflawless) or tag me on Instagram (@fundaflawless). 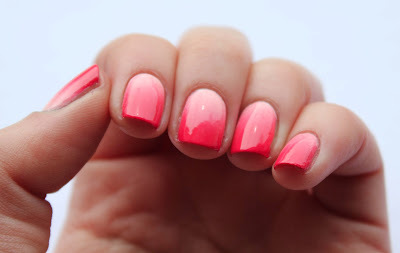 I've always wanted to try gradient nails out but never knew how to give it a go! Great tutorial, thanks! Very nice colors you chose. They look great together. Just discovered your blog and want to try all of these out straight away! Tried this one first with some greens and it looks great! Thanks!